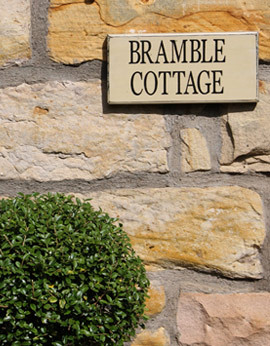 Originally built in the early 1800's as farm worker accommodation, Bramble Cottage has recently been extensively upgraded to cater for every modern-day need, whilst still retaining its full character on the outside, with random-rubble stonework construction and pantile roof - which remains part of East Lothian heritage. (Unless prior arrangements have been agreed). Entrance hall. Living-room with dining area. The living room has flat-screen TV with integrated Freeview and DVD player. The fully equipped kitchen is fitted with all necessary appliances and includes integrated fridge, freezer, and dishwasher, along with washing machine, combined microwave/oven, ceramic hob, grill and oven. Shower-room with toilet, wash-hand basin and heated towel rail. Due to historic listed building status, downstairs ceiling height is 6' 6". Double bedroom, with mirror dressing table. Separate bathroom with deep luxurious roll-top bath, wash-hand basin and heated towel rail. There are low combed ceilings upstairs which add to the overall charm and character of Bramble Cottage and care should be taken. Christmas & New Year Please email for availability and pricing. Friday to Monday and Monday to Friday.